Oh my. I've never seen Glee or American Idol. Can either version really beat the original? I feel like that all the time in clinic...I tell them things that are vitally important to the office, clinic or their patients and they just stare at me blankly and then go "wait...what?" 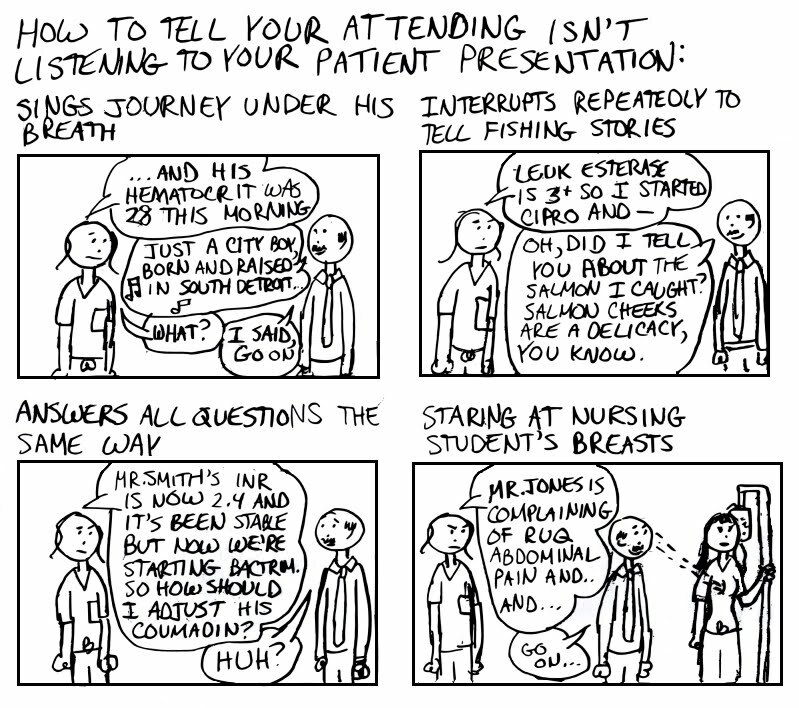 I'm also a big fan of the attendings who will ask you a question about your patient, before interrupting you after 2 seconds to answer the question they already knew the answer too. Sometimes, I think they just like to make us dance. It's SO HARD being an attending... as a paediatrician there's only so many variations of bronchiolitis, croup, gastro, asthma you can listen to before your mind starts wandering. There have definitely been occasions where I have been dreaming of a beach in Thailand when all I hear is the resident saying ".... so, what do you think those results mean?" On my neurology rotation, I had one attending that was the personification of distracted. During table rounds, he would periodically just stand up and leave the room. This led to some awkward silences among the students and residents and some interesting theories as to where he was going. After several minutes, he would return and apparently had forgotten that we had ever talked about a patient. Other times, he would stop you in mid-sentence with a completely off-the-wall comment about something unrelated. Of course, this is the same attending who, for some reason, had multiple pocket watches in both pockets. We finally postulated that he was actually a time-traveler and needed the extra pocket watches to keep things straight. We also used this theory to explain why he would often run into walls while we were on rounds and slap unsuspecting students with his alien hand. Looking back, I'm thinking we should have had him evaluated for CVA. He totally wasn't in it to win it! Kinda miss him though because Scotty and Lauren are boring to the max. Weekly Whine: Don't you CARE? You're smart, we get it!